The photos of colorful fish in a bowl on the wall are enticing, but after test driving one, this bowl is not an ideal home for live fish. It lacks a means for heat and light as well as a way to filter the water. In addition, it doesn't have a lid to prevent the fish from jumping out. With frequent water changes and proper location, it can be used to house one small fish, but I don't recommend it. Approximately one foot across and five inches deep. Mounts flat against the wall with fasteners included. Can be filled with water for fish or potting soil for plants. The product itself is well constructed of clear, sturdy acrylic. It mounts flat against the wall quite easily using the fasteners included. The outside surfaces clean easily, and the overall look is quite attractive. At only a foot across, the small size precludes using a filter. In the absence of filtration, water changes every few days are necessary to maintain high water quality. Fewer water changes may not kill the fish in the short term, but the fish are not likely to have a normal lifespan. The top of the bowl is open, making it unsuitable for fish that are prone to jumping. Feeding the fish and adding water is quite easy, but cleaning the bowl is a bit more challenging due to the small opening. It's so small that you should be able to put it anywhere, right? Not really. A draft can quickly change the temperature of a small bowl of water. To maintain stable water temperature, you can't mount it near a door, window, heating or cooling vent. Also, you can't put the bowl in a spot that receives direct light, as it will quickly heat the water and invite unwanted algae growth. Since there is no filtration, the bowl must be mounted with easy access to change the water. Place it too low on the wall, though, and the open top is inviting to pets or small children’s hands. 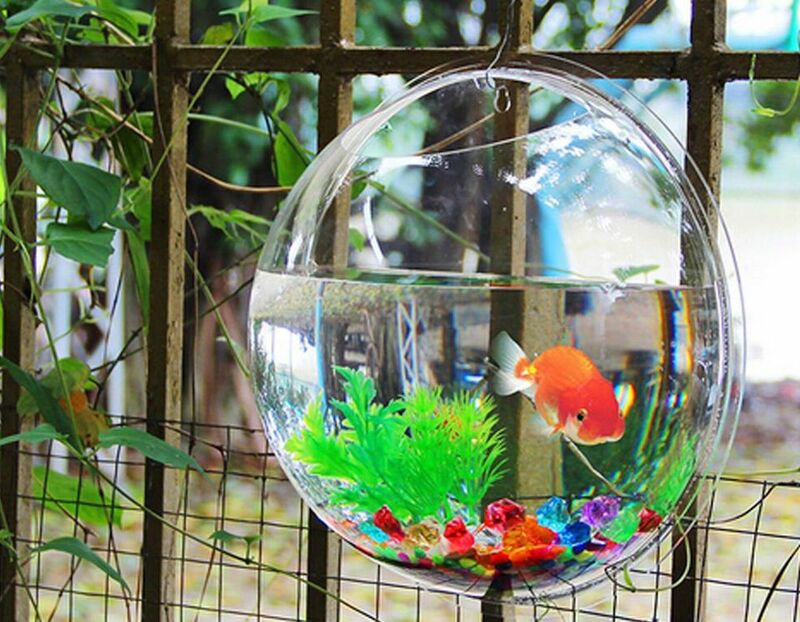 With proper location, care, and maintenance, it is possible to keep one small fish in this bowl, but it's unadvised. The wall fishbowl is better suited for displaying a live plant or an artistic display of colored sand, pebbles, or marbles.